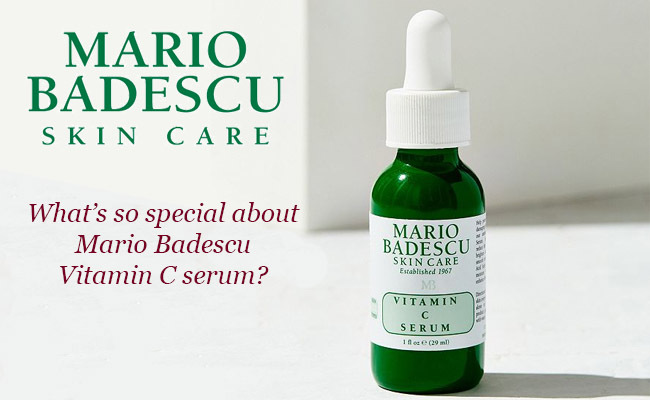 What’s so special about Mario Badescu Vitamin C serum? Let’s focus on the ingredients! What’s it like when using it? How to use it? When younger and healthier looking skin isn’t the only thing you want for your skin, a great choice for the well-being of your skin is a good vitamin C serum. Not only a vitamin C serum is going to sustain the collagen production in skin, fading the fine lines and wrinkles, but it’s also going to even your skin tone and brighten dark spots of various causes as well. Born in 1967, the Mario Badescu skin care line is a long lasting name that offers reliable options to acne and anti-aging problems. It creates cosmetic products for various skin issues, no matter the skin types. Established by the Romanian Mario Badescu, the skin care line gives you powerful, yet gentle solutions for better and healthier looking skin. The vitamin C serum from Mario Badescu is no exception and is formulated on 7.5% ascorbic acid (Vitamin C). it brightens your skin and lowers discoloration. Its formula also includes hyaluronic acid so it moisturizes the skin, eliminating the need of a moisturizer most of the times. It improves the elasticity and firmness in skin, leaving it younger and more radiant. Simple, yet effective, the formula of the vitamin C serum addresses all skin types and doesn’t cause irritation even to the most sensitive skin. Ascorbic acid (vitamin C)-keeps the damage of the bad UVs under control and sustains the collage in skin. It has anti-aging abilities and it’s anti-inflammatory too. It helps with the healing of damaged skin and moisturizes the skin. It keeps your skin younger and radiant. Cucumber extract-is a great ingredient that benefits the oily-prone skin. It softens skin and brings comfort to skin in case of windburns and sunburns. It moisturizes the skin. Ginseng extract-slows down the aging of skin and gives it a younger vibe. It keeps dryness under control and tightens the skin. It benefits the sensitive and oily skin as it has the ability to control oil production in skin. It brightens the skin and makes dark spots less visible. It keeps the outer aggressors away from skin and increases its firmness. Aloe Vera gel-is a common ingredient when trying to get rid of psoriasis and eczema. It helps the skin fight against aging and keeps acne at bay. It lessens the visibility of stretch marks and moisturizes the skin. Hyaluronic acid- it helps the skin look younger as it moisturizes and hydrates it for a long time. It fills in the fine lines and wrinkles and replenishes the skin’s natural youth. Lavender oil-whitens the scars and discoloration and evens the skin tone. It reduces inflammation and maintains the oil balance in skin. It works against acne and lowers the risk for breakouts occurrence. It calms the irritated skin and doesn’t dry out the skin. Propylene glycol-it’s a dependable ingredient that makes all the other ingredients work more efficiently together. It maintains the serum’s abilities. Even though the formula is strong, it’s safe enough to use on all skin types, sensitive skin including with minimal risk for irritations. First thing first, you should always use the serum on a cleansed skin. If you’re also toning your skin, do it before applying the serum. You can totally rely on the Mario Badescu Glycolic Foaming Cleanser for a thorough cleansing of your skin. Once your skin is dry, you only need 3-4 drops of the serum to apply on your skin. You don’t need to apply it every night. Any now and then is enough for getting great results. The serum has a nice consistency and sinks in skin pretty fast. It doesn’t leave an oily feel nor any kind of residue either. It has a pleasant smell that doesn’t linger for long on skin. Evening your skin tone, the serum doesn’t clog pores and leaves the skin soft and smooth, with a nice soft touch feel to it. It makes acne scars less visible and it’s very easy to use. Some like to follow it with a moisturizer like Mario Badescu Hydrating Moisturizer with Biocare&Hyaluronic Acid. The best way to tell if you need a moisturizer or not is to pay attention to your skin’s reaction to the serum. Keep in mind that it may tingle in the beginning, but this happens only until your skin adjusts to the formula. Easy to use and dependable, the serum comes for a great price as well. The good definitely outweighs the bad so you should keep that in mind when shopping. Powerful and well-priced, the serum is a valid choice most of the time. Other Vitamin C serums we have reviewed: the Mad Hippie, the Vitamin C Serum by LilyAna Naturals Review, the Skinceuticals C E Ferulic, the Obagi System, the Serumtologie.